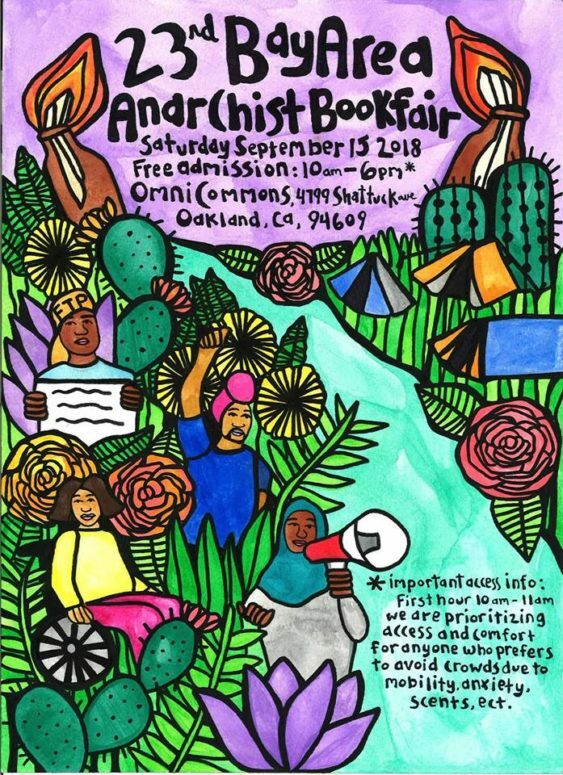 Anarchists, socialists, card-carrying members of the ACLU, radicals and assorted ne’erdowells will descend on the Oakland Omni Commons for the 23rd Annual Anarchist Book Fair. The Bay Area Anarchist Book Fair is one of the largest annual radical gatherings in the world with thousands of people attending and over 100 vendors sharing books, pamphlets, posters, artwork and more. The Bay Area Anarchist Bookfair is an annual event for people interested and engaged in radical work to connect and learn through book and information tables, workshops, panel discussions, skillshares, films and more. They have created an inclusive space to introduce new folks to anarchism, foster productive dialogue between various political traditions and anarchists from different milieus, and create an opportunity to dissect our movements’ strengths, weaknesses, strategies, and tactics.